Autumn, the most fleeting of Europe’s seasons, is my favorite. The sun is warm and the light is soft, strikingly different than the glaring summer’s heat. The days are still long enough to go for evening walks in the vineyards below my house, where the harvest is underway. I usually feel the most productive this time of year. I feel inspired by the new season, by the pressing feeling that the year is almost at its end, when in reality there is almost a quarter of a year left. There is a sense of urgency that spring and summer lack, and which winter suffocates. Nature accommodates the mood too. It is unfortunate that so many people travel to Europe in the summer where everywhere is hot and crowded. I know that people travel when their jobs and budgets allow, but early autumn, before the trees are barren, is stunning. Nothing makes a castle look more audacious than viewing it with the splendor of a golden and crimson forest surrounding it. The crisp air with brilliant blue skies further highlights the explosion of colors as you drive down the autobahn. We know the dark winter is approaching, so we all soak up the last bit of warmth and sun that we can, before we have to start our vitamin D supplementation. Late summer and early fall are fantastic times to be in Germany. I love every day that I get to live in Germany, but this season impresses upon me the most how blessed we are. Wine festivals are at their height, harvest festivals bring on the fall flavors of pumpkin and Federweißer (a fermented freshly pressed grape juice, which is possibly the best tasting beverage in the world), and apple picking festivals abound, in case the other cultural festivals are not enough. Of course there is the famous Oktoberfest, the world’s largest Volksfest, which started in Munich in 1810. We have never been to Oktoberfest, having always been charmed by the many fests in our area of Wiesbaden and Frankfurt. We have never felt the need to go to an expensive and commercialized event. 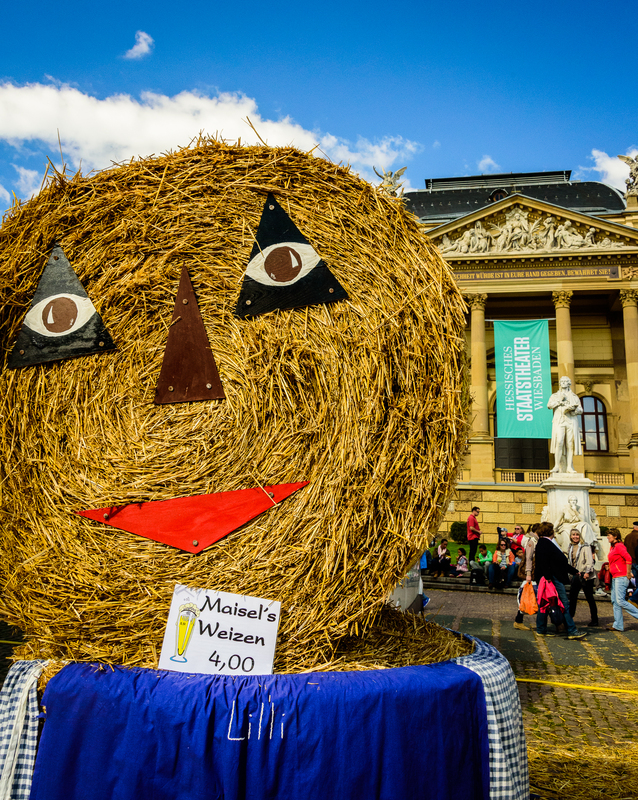 Just last weekend we visited Wiesbaden’s pumpkin festival where we were greeted with smiling hay bales, gourds of all shapes and sizes, and most importantly, pumpkin wine! The weather was perfect and it was refreshing to see families gathered around the food booths and the children playing in the hay or watching the sheep. Add the fact that almost everything is closed on Sundays and that is a heck of a lot of time off. If you forget to go shopping you can run into trouble! Thankfully now we know, our first spring was a little rough on the cupboard. My point is that Germans make time for leisure and family bonding. They use it. Not only do they get these wonderful holidays, they also get heaps of vacation time, at least 21 days. I always see families riding bikes together, or hiking in the woods along with their dogs. Everyone has a dog, and they go everywhere with them. I have gotten so used to seeing dogs in restaurants, and elsewhere in public, that I hardly notice them anymore. The festivals are always packed with good-natured people eating bratwurst and drinking beer out of gigantic steins while their children play together. I am sure many Germans have stressful jobs but it appears that they are very good at separating work time from play time. Something I know Americans could benefit from. For example, when dining out no one has their cell phone on the table. They are actually spending time with the people they are with instead of fiddling around with their smartphones. Living in Germany has taught me to be slower, to not cram too many things into one day. Not having a real job contributes to this too. It has taught me to eat at home, the meat and produce is so fresh and such a good price. 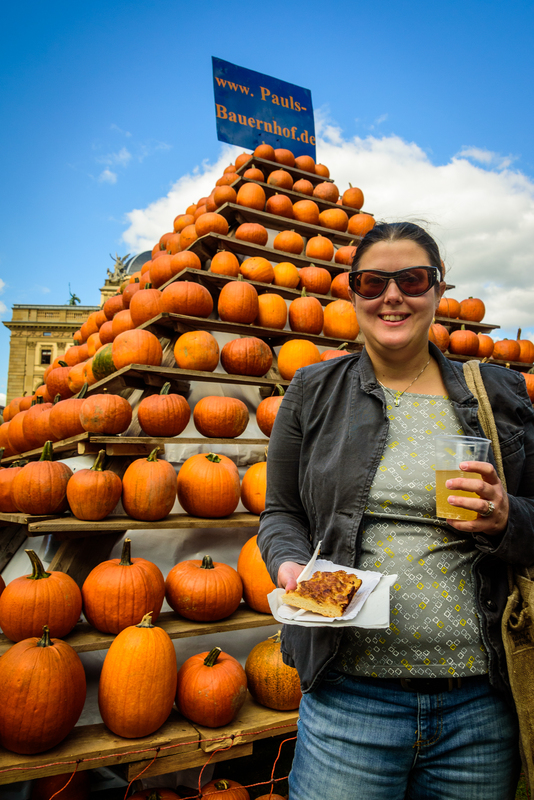 It has taught me the joy of seasonal food; I wait in anticipation for spargel (white asparagus) season in the spring, apricots and cherries in the summer, pumpkins and squash in the fall, and of course Glüwein at the Christmas markets. It has taught me to enjoy seasons and what they each have to offer. I come from California where I never knew the pleasures that a variety of weather and a changing environment can bring, not to mention the inconveniences (ice: scary, hot: annoying because there is no air conditioning anywhere!). Toward the end of fall, activities and tourist places start closing. There is a true winding down of the year. Then one day you go outside and find you are freezing, the clouds occluding any possibility of the sun’s warmth, the trees are impoverished without their leaves, and it is midnight dark by 5:00 in the evening. Very, very good writing. I’m impressed! Definitely! I am sure the Eastcoast is splendid this time of year too. We’ve missed you guys. When are you back?